The final phase of one of the most anticipated biking and walking projects in the Chicago region will be delayed until 2019. 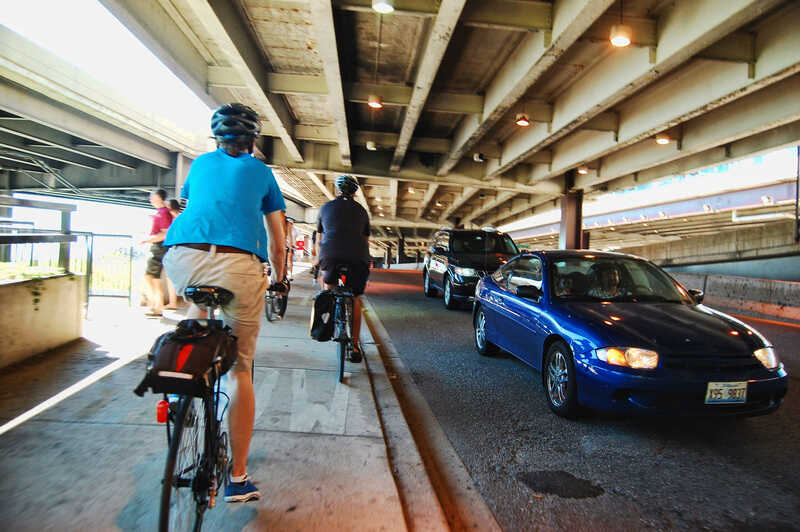 Mary Wisniewski of the Chicago Tribune reported this week that the Navy Pier Flyover – which will allow people biking and walking on the Lakefront Trail to bypass congestion around the popular tourist destination – will not be completed as scheduled in 2018. The Chicago Department of Transportation (CDOT) says the first two phases from Ohio Street Beach to the Lake Shore Drive Chicago River Bridge will be open to the public by the end of 2018. The final phase that stretches over the river is expected to be complete by the middle of 2019. The city says the delay is needed because the existing bridge over the river requires structural repairs. The final segment of the flyover will run through an opening in that bridge. It’s disappointing that the bridge deficiencies are only being identified now – more than three years after construction on the flyover started. If they had been identified earlier, perhaps they could have been addressed while construction continued, and the project could have stayed on schedule. The flyover is one of the most visible and talked about infrastructure projects in the city. It will eventually carry more people biking and walking than many roads carry people in cars. Every week Active Trans fields questions about its status from supporters and the media. For years we have asked the city about its status and been assured it was on schedule for completion in 2018. We urge city and state leaders to come together to fully fund and build all three phases of the project moving forward, avoid any further delays, and open the complete flyover to the public in 2018. It's a long overdue investment in safe biking and walking infrastructure. Until phase three is completed, the travel lane nearest to the sidewalk should be used for the trail and should be physically separated from vehicle traffic. This way people biking and walking can enjoy the first two phases without being further limited by ongoing construction. Join our advocacy alert list to stay up to date on the flyover and all of our trail work. Active Trans is providing input on the Chicago Park District’s plan to provide separated trail space for people biking and people walking along the full length of the Lakefront Trail by the end of 2018. We meet regularly with the park district to monitor that project along with the Chicago Area Runners Association. UPDATE (10/18/17): Streetsblog Chicago reported that CDOT plans to close the easternmost northbound lane of Lower LSD to accommodate foot and bike traffic from the trail during phase three of Flyover construction.